Having been held for 17 consecutive years, the Jakarta International Handicraft Trade Fair (INACRAFT) is the most prestigious occasion for the handicraft industry in Indonesia. INACRAFT is one of the chief trade events related to the gift and handicraft industry in the country. The event goes a long way in helping participants learn more about the latest market trends and developments in the industry. 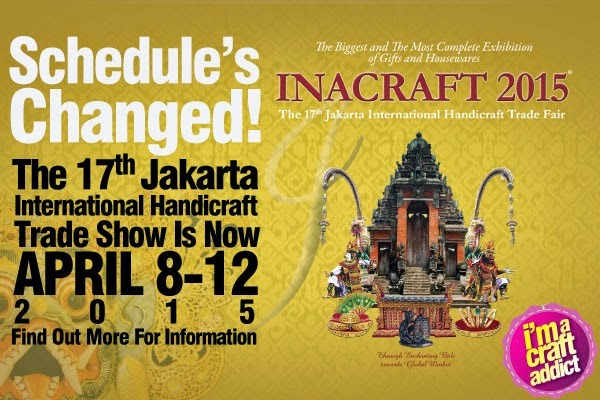 On Wednesday, President Joko Widodo, better known as Jokowi, opened the 17th INACRAFT, which will be held from April 8 to 12 at the Balai Sidang Jakarta Convention Center. INACRAFT 2015, the biggest and most comprehensive exhibition of gifts and housewares, was organized by the Association of Exporters and Producers of Indonesian Handicraft (Asephi) in collaboration with Mediatama Binakreasi. The annual INACRAFT event has become an iconic exhibition of Indonesian handicraft products, and is in line with the governments agenda to consistently develop the quantity and quality of products. In his opening address, President Jokowi expressed hope that Indonesia will rank first as an exporter of handicraft items, moving up from its current position in the twelfth spot. "With the variety of handicraft products made in the country, I hope Indonesia will, one day, be the top ranking exporter of handicrafts," President Jokowi said. The head of state pointed out that Indonesia currently ranked twelfth after China, Italy, Germany, the United States, France, the Netherlands, Belgium, Japan, Britain, Vietnam, and India. Jokowi, who established a thriving business with a strong overseas market for his products, stated that he had participated in INACRAFT three to four times when the fair was first organized. "I see quite a large interest in the international market because the quality of Indonesian handicrafts and goods is great," he remarked. According to the president, participants of INACRAFT must be selected strictly in the future to ensure that the quality of products displayed is maintained. He further noted that to compete at the global level and in the open market, several factors should be taken into account. "We have to give importance to the designs, as well as to packaging and the colors used, to make sure that they suit the tastes of the market, as these are what attract buyers to the products we sell," the president explained. Jokowi added that design was crucial, and that if Indonesian handicraft industries intended to enter the European market, they should find designers from Europe, such as those from France, Italy and other countries. He also expressed hope that the Indonesian handicraft industry will continue to be developed to be able to compete with products from foreign countries. Moreover, Chairman of Asephi Thamrin Bustami said that a total of 1.6 thousand companies from all provinces across the country were participating in INACRAFT 2015, which is expected to be visited by some one thousand foreign buyers and 200 thousand domestic buyers. He noted that craft industries in Indonesia had started to show potential, which was apparent from the increasing number of local craftsmen coming up with new innovations and creative new products. Promising economic demands and market opportunities have made these industries more interesting and reliable to explore, a glimmer of hope for national economic growth and improvement. With its sub-theme "Improving the Quality of Creative Handicrafts to Penetrate the Global Market," this exhibition is expected to showcase the existence and compatibility of Indonesian creative craft industries to the international craft community during a period of stiff competition from similar products manufactured by other countries. Last year, INACRAFT 2014 had adopted the Central Java cultural inheritance as its main subject, a move that was aimed at developing creative economic products. This was done to improve the export quality of Indonesian craft products so they could become one of the alternative sources to support the national economy in this global era of free trade. Furthermore, more than 1.5 thousand professional companies are presenting at the fair, including a large contingent of foreign exhibitors. An extensive array of home decoration items, garden designing concepts, gift products, embroidered garments and fashion apparel are on display at the fest, which also offers corporate attendees scope for networking. Exquisite batik prints and paintings are exhibited at the show, as well. In addition, senior representatives of the National Handicrafts Council and other government organizations feature among those presenting at the show. The Indonesian archipelago is famous for its cultural and traditional diversity, whether original or adaptations with different combinations. Handicraft products are also part of national inheritance that needs to be maintained and preserved so it can become a national asset.